A mix of Dead Island and Mirror’s Edge may not seem wholly succinct; Dying Light’s fantastic free-running is a great notch on its belt of successes. Though Techland games have been certainly mixed in the past, Dying Light clearly sees the developer putting in a full effort, delivering a unique zombie game in an incredibly dense market. It’s a shame some frustrations get in the way, but so long as you’re able to get past these irritations, you’ll reap the rewards of Harran in no time. While seemingly a typical zombie set-up, Dying Light takes a different approach to other such games. More serious in tone than Techland’s previous works, you take the role of GRE agent Kyle Crane. Crane is sent undercover in the infected city of Harran, as he attempts to secure a less than flattering document which could ruin the Global Relief Effort. As the game progresses, Crane begins to work with a group of survivors located in The Tower, who rescue Crane at the expense of one of their men. What follows is a somewhat predictable yarn that has Crane questioning which side he should follow, while Crane also tries to earn the favour of the main antagonist, a scenery chewing and unnecessarily mean douche. None of the characters ever really leave their mark, and it’s hard to sympathise or relate to the poorly voiced, morally questionable protagonist. While the story may not be anything special, Dying Light stands out with its fantastic parkour mechanics. The main reason it works so well is its inherent smoothness. Despite the first-person perspective, climbing is done at the touch of a button, and scaling buildings is simple as can be. Jumping between objects works too, though sometimes you may need to push the grab button for Crane to lock onto a ledge. There are lots of other thrilling opportunities which come from free-running, as zip lines present a speedy way to zoom to the bottom of a higher locale. Crane can dive into trash piles to avoid death from higher falls, dive into the sea and – through an unlockable ability – even jump over zombies. Free running is so good in Dying Light, you may find yourself running past zombie encounters altogether. When the time comes to fight however, things become a bit familiar. 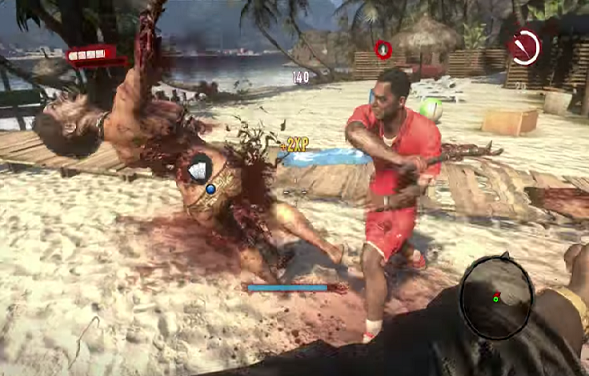 Borrowing a lot from Dead Island’s combat, you spend a majority of the earlier portions of the game brandishing a melee weapon. These range from typical slicers like machetes, swords and axes to more makeshift clubs, like pipes and wrenches. Like DI, weapons come with durability, and using your weapon will decrease it until it can no longer be used. You can repair a weapon a certain amount of times, using metal pieces, but eventually a weapon becomes useless. It leads to scavenging, but weapons aren’t quite as frustrating this time, not breaking so quickly. 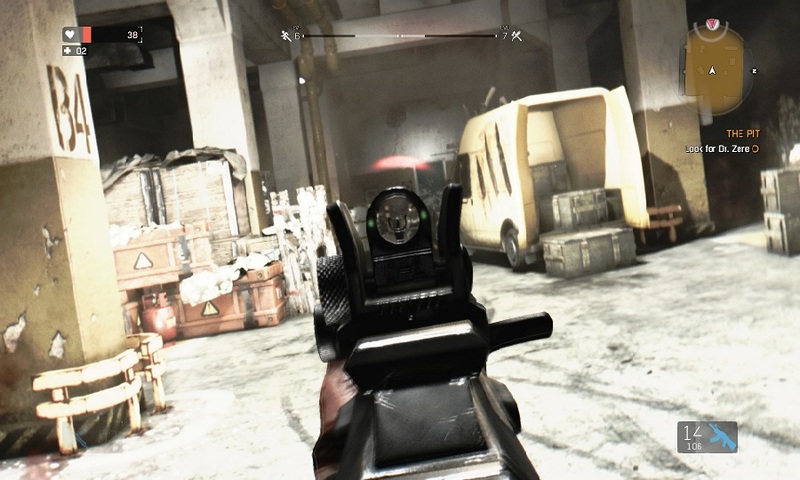 You do eventually acquire firearms, and these are more useful than DI, showing better collision detection and aiming. Combat works well enough, but enemies can be frustrating, particularly grabbers which force impromptu quick-time events. Bigger enemies can be incredibly difficult too, using cheap and frustrating knockdown moves. 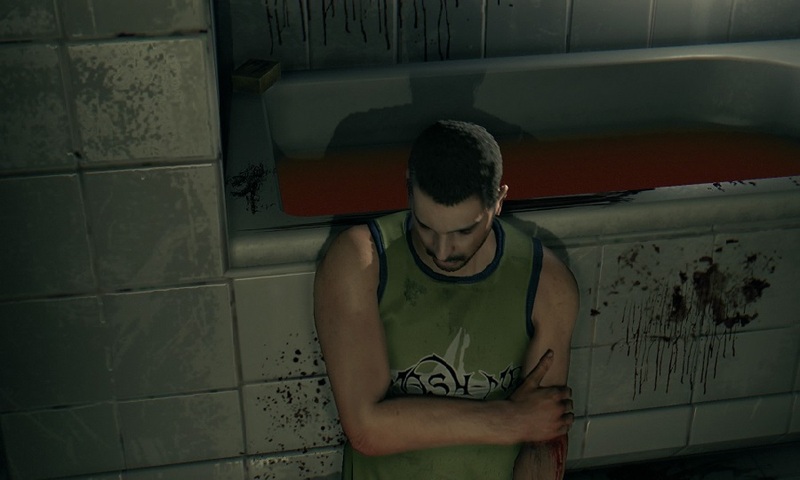 It’s a shame, because like Dead Island, frustrations can get in the way of Dying Light’s genuine fun. The unfortunate reliance on simple, point-A to point-B missions is prevalent, leaving you feeling like an errand boy (which, ironically, Crane calls himself at one point). Side-missions are particularly dull, mostly consisting of these kinds of tasks, and even the story begins to feel like a slog during its middle. However, things pick up nicely, leading to an exciting climax, and some side missions stand out, such as one where you relive the past of a scared, young child through his tape recordings. But for every good mission, another one comes around which can be cheap, dull or simply a chore. And it’s disappointing, because everything else in Dying Light works so well. 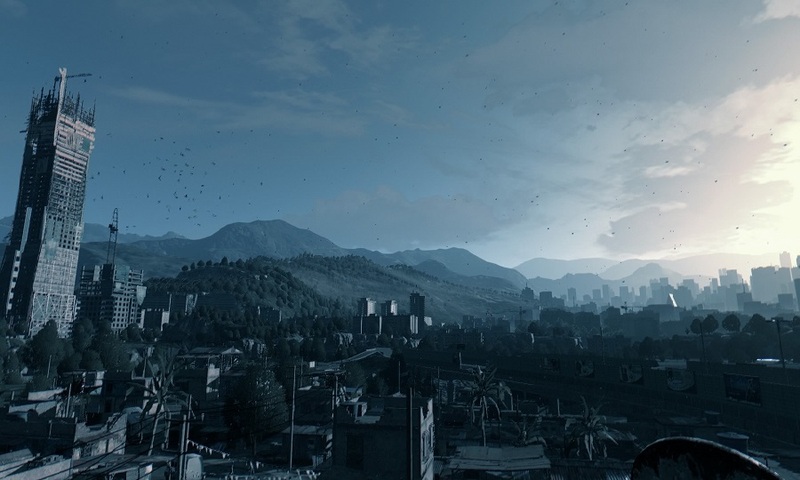 Dying Light also becomes a different beast with its day-night cycle. During the day its standard stuff, as while zombies are on the prowl, they’re mostly slower and less aggressive bar runners. At night, the intensity cranks up, as more aggressive zombies are present, Volatiles bring the pain as the toughest form of zombie and pursuits can occur which force you to run from dozens of zombies. But rewards can be reaped, as double XP is rewarded for everything. Survivor rank improves your general skills, Agility adds skills to parkour and Power lets you perform tough moves such as tackles. In other words, you’re rewarded for all your playstyles, and Night runs present tense experiences. A quick drunken sight-seeing tour is in order! The city itself is another highlight. Harran is a technically intricate, exciting place to explore. Built with parkour in mind, there’s nothing more thrilling than escaping a chase by sliding, jumping over gaps and climbing buildings. Divided into two areas, both come complete with activities. Side missions are plentiful with 50+ altogether, Quarantine Zones challenge you to find supplies under dangerous conditions, Challenges test both your parkour and combat skills under time and random events occur, such as protecting survivors from zombies and soldiers. You’ll easily clock a good thirty hours into Dying Light with all its content. 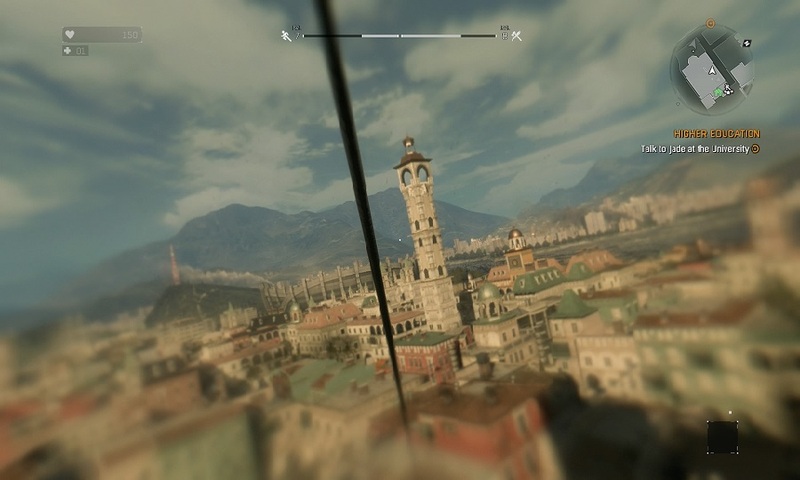 Taking advantage of the PS4’s power, Techland have focused on Dying Light’s free-running animation, lighting and detailed city, all of which look excellent. That being said, characters can look stiff and poorly animated, as well as suffering from repetition of models. The frame rate can also tank in tense situations, but it’s not enough to diminish the visual splendour. Sound isn’t quite as successful, as while the synth music can be atmospheric, voice acting ranges from bland to hammy, and the dialogue fails to get you invested in the story. Dying Light deserves to be commended for what it achieves, and not dismissed for instances where it misses the mark. The free running is simply stupendous, bringing smooth platforming in a perspective which typically doesn’t work. Not since Mirror’s Edge has parkour worked so well. But Dying Light can be bogged down by somewhat tedious missions and frustrations. Those with patience, though, can enjoy the fruits of their labour, and Dying Light is so satisfying when it works. Those looking for an exciting new way to explore a zombie sandbox should give Dying Light a go.